As promised here's our second shot at trying our the Play and Freeze Ice Cream Maker. The first time was a dud but I wasn't involved so this time I had to try it out for myself. I have to start by saying that my camera died only a few shots in so the pics I have to post may not seem appropriate since kids and alcohol are both involved but I promise the two never mixed! We had so much fun with this ice cream ball on an end of summer camping trip. Five couples each with a couple kids makes for many people to keep this thing rolling and tumbling which is exactly what we needed. Wow..this is not the ice cream ball. It's the "Mega" ice cream ball. So it makes a quart of ice cream instead of a pint or so and with that said it means its heavy when all ingredients are in place so it was amusing seeing 3 and 4 year olds trying to get this thing moving. 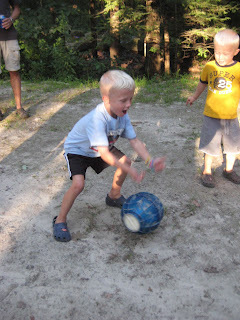 I have to say again...this was SO much fun and the kids were so anxious to eat homemade ice cream around the campfire. So first we added all the ingredients..heavy cream, sugar, and vanilla and sealed it shut. Opened the other end, added ice and rock salt then sealed it shut. Then the fun began. As I mentioned it was quite heavy so it was a little challenging but then the brilliant idea of bowling came about. 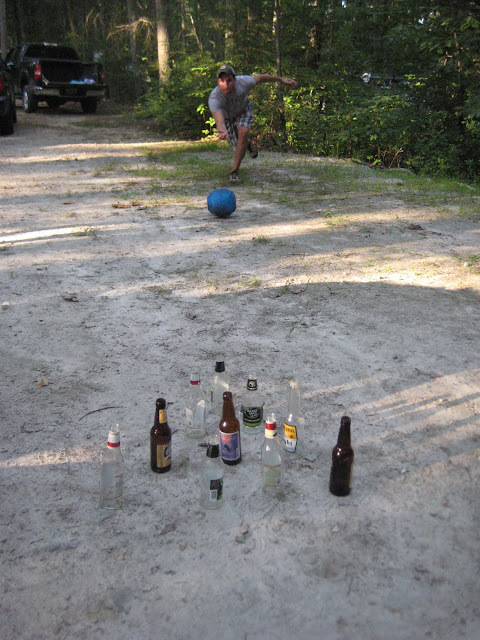 Beer bottles + ball = ice cream ball bowling! OMG...hysterical and fun. I must say...kids don't try this at home....it could get dangerous as again, this thing is heavy! The ball itself took a little bit of a beating during our bowling tournament but nothing that harmed the final product so it all went just fine. It did take awhile to make. You had to keep it going for 20 minutes then add more ice and rock salt and go another 20 minutes. You can probably imagine how many times we heard from the kids..."Are we almost done yet?"... "When are we going to have ice cream?" Well when we were finally done we had soft serve consistency ice cream and a good amount of it because each kid got a half cup and then enough for us adults to taste test. It was super creamy. The end closest to the ice came out somewhat hard and then the other end was a little soupy but when mixed it was perfect. Sorry for the lack of photos of the actual ice cream since my camera died on me. Definitely a fun thing to bring along camping or on a picnic or your back yard. Everyone was so into it and anxious to see if this ball thing would actually produce real ice cream. It was a success and super fun....definitely recommend! Turkey Hill is getting ready for some foooooootball! This is so not right being a New Englander and proud Patriots fan (poor Tom Brady got in a fender bender last week..hope his hair isn't messed up ;)) but we love Turkey Hill so I we'll play nice and tell all you Steeler fans about an awesome chance to win tickets to see the Steelers that Turkey Hill is scooping out. All you have to do is purchase their football crazed flavor, Blitzburgh Crunch, go here and enter a code found on specially marked packages, and get a chance to win two tickets to a Steelers home game on December 23, 2010. Wait...there's more... during each of the First Prize drawings, you also get a chance to win a $25 Steelers gift cards and then the kicker...at the end of each season (2010, 2011 & 2012! ), they'll select one fan to receive a Grand Prize — a pair of Steelers season tickets. So I might not be as big of a football fan as I am of ice cream but this sounds like a good deal (if you win of course) and the flavor doesn't sound so bad itself either. Actually I do have to say this ice cream sounds fantastic. Blitzburgh Crunch is a whole lot of sweet cream vanilla ice cream with chocolate cake crunchies and crunchy chocolate cookie swirl. I love crunchies in ice cream. Actually kinda reminds me of how much I love the crunchies in the middle of a Carvel cake..yum...so if this is anything like that I'd love it. But I have a feeling I will love it regardless. Oh and I guess I could enter but not sure season tickets would do me any good up here in RI but still looking forward to trying the new flavor. I'll just cover up the label when I bring it to a football party just in case! 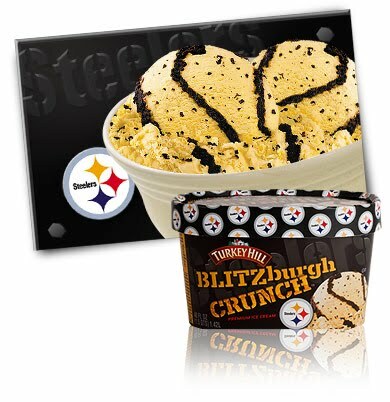 Promo ends 1/31/2011 so get out there and get yourself some Turkey Hill Blitzburgh Crunch, let us know how it is, and most importantly don't forget to enter the sweepstakes. Eagle Brand Homemade Ice Cream Recipe Contest Winners! Congrats to the winners and thank you to everyone for playing! We think all the recipes looked yummy and can't wait to try them! Thank you to Eagle for sponsoring the contest! Yup we're still here. After a crazy summer we are getting back into the swing of things. And yes, the winners of the Eagle contest to follow soon (sorry for such a lag and we SO appreciate all who entered). First taste..me with the dark and she with the white. Very yummy. I definitely prefer the dark version over the white. It has a rich flavor but not very strong. I guess they have to be kid friendly (crazy enough my 5 year old prefers dark chocolate too though) and the white was just okay to me but my daughter loved it. 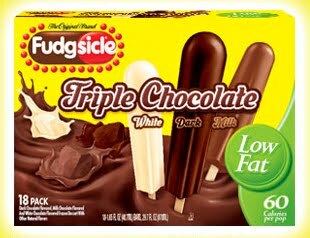 I think I am just used to your traditional fudgesicle taste and this departs from it a bit. All in all I have to say I would get these again. Especially for a sweet treat that does satisfy without being over indulgent. And for a sweet treat they are not too bad on the calorie count...60 calories, 1.5 g fat, 9 g sugar. GET COUPONS FOR TWO FREE POPSICLE PRODUCTS! Leave a comment about your favorite Popsicle product or you must have a great childhod memory of Popsicles that you could share with us. We'd love to hear! Comment by Wednesday, Sept 15th for a chance to win two coupons each for a Free Popsicle product ($4 max value on each). One winner will be chosen. Hmm...my priorities while away on girl's weekend in Philadelphia..sleeping (with a 1 year old its limited), eating (I never realized Philly is such a foodie town), cocktails (given! 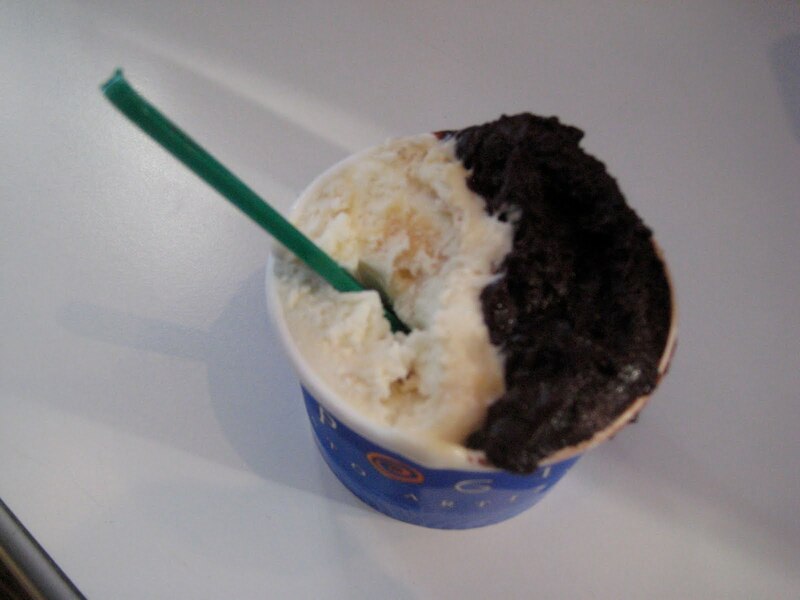 ), and of course, ice cream! So as I am sipping my totally yummy sangria at the coolest Mexican place, El Vez, I notice across the street this cool and busy artisan Gelato shop, Capogiro. Unfortunately time did not allow to go afterwards but I made a mental note and knew we'd be back. My ultimate decision...Rich Dark Chocolate and Dulce de Leche. 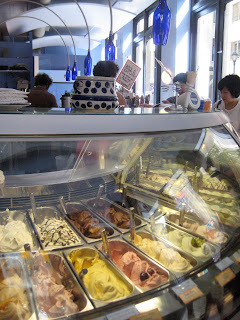 Seriously the chocolate gelato was the best I have ever had. It was super rich almost like a fudge brownie but not overwhelming and the sweetness of the caramel balanced it out. I must say they were both great choices. I do have to add though that it was not cheap. I think I paid $4.75 for a small (pic makes it look big..but not really). 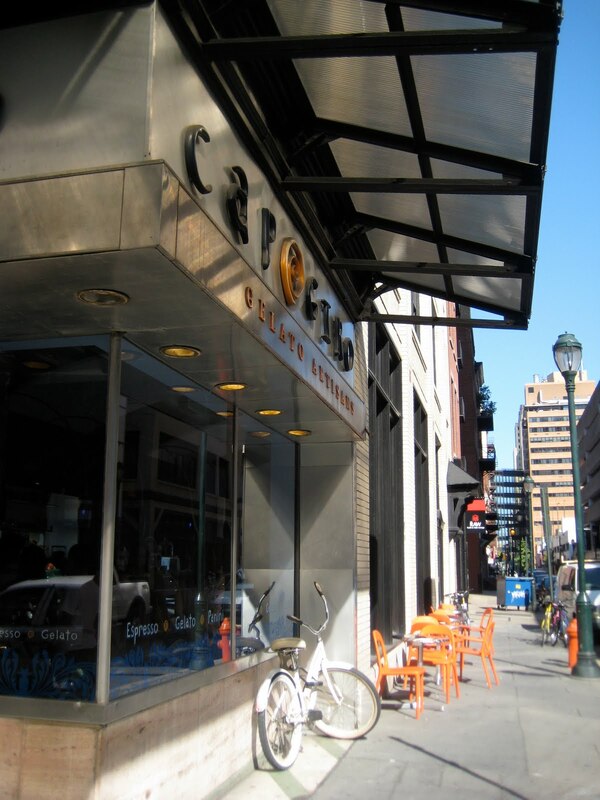 But with that said Capogiro prides themselves on using pure, natural and fresh ingredients taken from Pennsylvania's farmlands and local dairy farms. Their flavors are all based on what's in season so the menu changes monthly or I bet daily sometimes. You can actually order online which could always be a fun gift idea for us ice cream lovers.